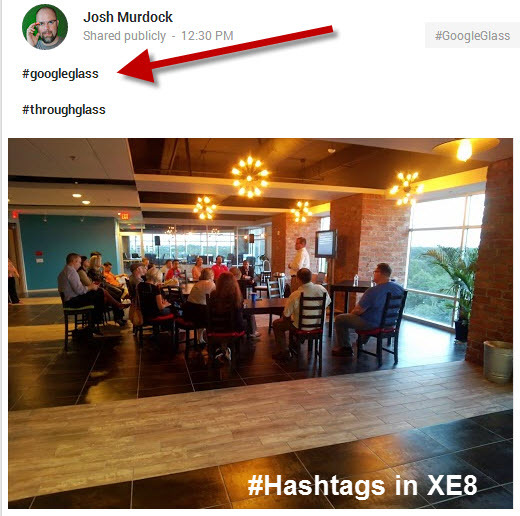 The latest update to Google Glass XE8 has finally added the ability to add a hashtag (#) to your captions as you share your photos and videos. Tag your shared pictures and videos with trending topics by adding a hashtag to them. When adding a caption, say hashtag and then the topic at hand. For instance, adding a caption like “hashtag cute” becomes “#cute.” It’s worthwhile noting that all captions through Glass are also tagged with “#throughglass” automatically. I tested this successfully with sharing on Google+ by adding the hashtag #GoogleGlass to a photo being shared. I wasn’t successful adding a comment to a photo shared via Twitter. It still doesn’t seem to add the comment or the hashtag, besides #throughglass to the tweet. I’ll be testing out a few more of the new XE8 feature over the next week. Come back for more soon.